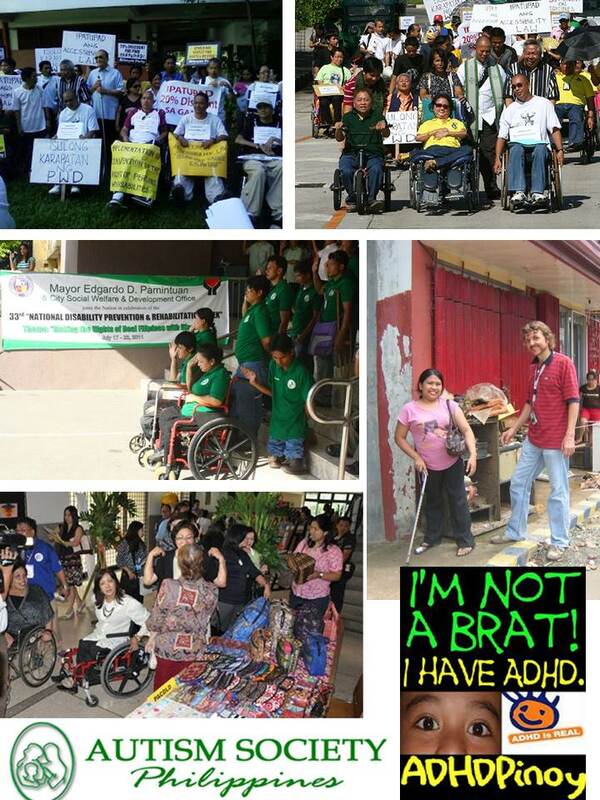 Government and Taxes: PWD Discount 1: Who are Persons with Disability? In a complaint email last Tuesday by James Auste, head of the Cancer Warriors Foundation (CWF), why Mercury Drugstore did not give sell him his medicines for more than one month, he was answered by Atty. Edsel Manuel of Mercury. The latter gave me permission to blog his comments, thanks Atty. Manuel. Is one suffering from Chronic Illness a Disabled person? This has been discussed with the National Council for Disability Affairs (NCDA) 2 years ago and was answered in the negative. Republic Act No. 7277, "An Act Providing for the Rehabilitation, Self-Development, and Self-Reliance of Persons with Disability and Their Integration into the Mainstream of Society and for Other Purposes," and otherwise known as "The Magna Carta for Disabled Persons," was passed in March 24, 1992. This specifically required the Department of Health (DOH) to, (I) institute a national health program for PWDs, (2) establish medical rehabilitation centers in provincial hospitals, and (3) adopt an integrated and comprehensive approach to the health development of PWD which shall make essential health services available to them at affordable cost. Rule IV, Section 4, Paragraph B of the implementing rules and regulations (IRR) of this Act required the Department of Health to address the health concerns of seven (7) different categories of disability, which includes the following: (1) Psychosocial and behavioral disabilities, (2) Chronic illnesses with disabilities, (3) Learning (cognitive or intellectual) disabilities, (4) Mental disabilities, (5) Visual/ seeing disabilities, (6) Orthopedic/moving, and; (7) Communication deficits. As can be gleaned from the above laws, persons having mere chronic illnesses are not considered as Persons with Disability (PWD). This was made clear during the National Council on Disability Affairs (NCDA) committee hearing held last October 20, 2011. Sad to say, during the early days of implementation of PWD discount, Mercury Drug was lenient in accommodating Chronic Illness, but there were abuses by certain persons like a municipality who issued PWD IDs to most of its employees and stated in their IDs that they have a disability of “Chronic Illness,” but only to discover that they only have sinusitis. Cancer is a Chronic Illness and one who has a chronic illness does not necessarily mean that he is disabled. Our Constitution gives power to Congress/Senate (Legislature) to enact laws and the Executive to implement the laws. For orderly and proper implementation of laws enacted by Congress the Executive is given a delegated power by Legislature to enact Implementing Rules and Regulations. Hence, this IRR and other rules, such as DOH Administrative Rules are also called laws which must also be followed and observed. The one month limitation drug purchase cannot be found in RA 9442 because that is provided in DOH Administrative Order No. 2009-0011 that the “dispensing of medicine must be in accordance with the prescription issued by a physician and should not exceed one month supply.” This law is very clear and as an advocate for rights and observance of law you should understand this and should have followed. Your prescription is over one month supply and we are merely following the law. Are those with congenital talipes equinovarus or clubfeet/clubfoot considered as PWD?how about those with cleft palate? can anyone provide a list of diagnosis approved to qualify for disability. Are those who suffer from polio are considered pwd though only one foot is only affected? Are people with severe rheumatoid arthritis and have difficulty in walking and standing considered as PWD? I am kidney transplanted. My disability is immune mediated. I was issued a pwd id by our city. However a big drugstore keeps questioning its legality. Where does that place me? Shouldn't we be considered as pwd's?